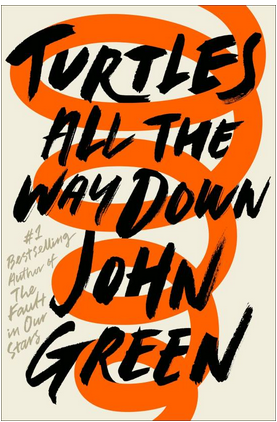 Before I write about John Green's “Turtles all the way down”, let me first state that I haven’t yet read the author’s much acclaimed “The fault in our stars”. Nope, haven’t watched the movie either. So I didn’t have any idea about the author’s writing style or narrative when I started reading his new book. My reading routine of “Turtles” will give you an idea about the flow of the book. Over the last one week, I had been reading 30-40 pages every night before going to bed. So yes, it is NOT a page-turner or a gripping narrative. It leaves a strong impression in those short reading sessions. A slow paced turn of events with some memorable phrases and passages interspersed throughout the book. “Turtles all the way down” is the story of Aza, a teenager who is struggling with her pattern of thoughts, that interferes with her daily routine and life’s decisions. It is also the story of Davis, a childhood friend of Aza and whose father had mysteriously disappeared. The mental and emotional struggles of these two teenagers, along with the support they give each other form the crux of the story. Aza’s friendship with her best buddy Daisy provides for some interesting moments and arguments. The synopsis and the first few chapters give an impression that the plot is a mystery thriller but after 1/4th of the story, you realize the struggles of Aza being the core issue dealt with. Her character is well-etched, her mental struggles make you want to help her out somehow. I wished the author had shared the reasons that resulted in Aza facing those thought spiral and anxiety issues. I concluded that it has to do with her father’s death. The last line of the first chapter sums up the rest of the story beautifully - “Anybody can look at you. It’s quite rare to find someone who sees the same world you see.” This is my most favourite line in the book that captures the bond between Aza and Davis. “In the best conversations, you don’t even remember what you talked about, only how it felt” => So true, isn’t it? “You remember your first love because they show you, prove to you, that you can love and be loved, that nothing in this world is deserved except for love, that love is both how you become a person and why” => Beautiful lines these are! I wouldn’t recommend this story as a MUST-READ but the slow paced narrative and the beautiful passages leave an impression on you. Read it for the beauty of the words, take it slow and savour it! And if you are like me, you'd have a pencil or highlighter handy to capture those phrases that would make you pause for a bit before proceeding further.